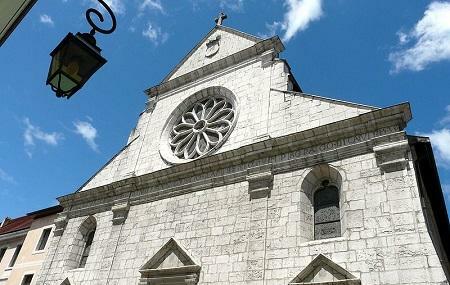 Cathedrale Saint-Pierre was formerly a Franciscan chapel. The cathedral is a peaceful attraction with marvelous gothic architecture. The carvings, arches and dome of the church is spectacular too.in the church you will see stained glass windows, that illustrates the story of Saint François de Sales. In all the Cathedrale Saint-Pierre is an ideal to get an insight of Saint Francis de Sales and spend some peaceful time in the holy place. The entry may not be free. However the admission fee is not available. How popular is Annecy Cathedral? People normally club together Church Of Saint Francis and Church Of St. Maurice while planning their visit to Annecy Cathedral. Beautiful church and beautiful town. Well worth a visit. Know as the Venice of the Alps it is criss crossed with small streams and also has a vast lake sounded by snow capped mountains with beath taking views. Beautiful church particular the light from the afternoon sun. Great architecture. Sits on top of a river.